Yeats was a golden doodle who died too soon. A member of the family, my daughter called her Sister and told her daughters Yeats was their aunt. It was meant to be fun, but it was also befitting. She was the third member of our household — Sandy, Joe, Yeats. She completed us. She was born, as close as we can tell, December 8, 2008. She died September 20, 2018. Nine years 9 months. Too soon. She is missed, but she will always be a part of who we are. When I was seven, I was hit by a car. It was early March, the month of St. Patrick and of my special day, the feast of Saint Joseph. The accident is significant to me because that’s where my chain of memories begins. Before that, all I have is a collection of vignettes any one of which could be a memory, the residue of a story someone else has told me, or the imprint of an imaginary episode. When I rifle through them I sometimes feel I can order them chronologically. But they don’t connect to one another the way the memories do beginning with coming to while lying in the middle of the street one block from home with a mosaic of faces I didn’t know hovering above me. First, you’ve got to clear your head. Because your head just keeps saying things that aren’t true. Well they are true most of the times you’re saying them. But sometimes like last Wednesday, they aren’t true. That was the day I saw the biggest, most beautiful butterfly I’d ever seen…. Before I get to poetry, I want to pose another question particularly for two groups: Actors and real people. I know a few actors. Several, in fact, who are not only good at acting but are very good friends. It never occurred to me to ask them if they were real people. I just took it for granted. Now I wonder what they would have said to me. Have any of you out there who have actors for friends or who just know some actors well enough to talk to them ever asked if they were real people? (We’ll assume they are real something — but it’s the people thing we need to know.) What did they say? It’s been a while, but I can’t not post anymore. Please take a moment to visit the Bacopa Literary Review Editors’ Blog and read the post for today put up by Mary Bast, the Bacopa Literary Review Editor-in-Chief. My story “Eva” was published in the 2016 issue and was the 2016 Fiction Runner-up Prize Winner. Mary’s been very gracious and generous in her comments to me about the story, and now she’s taken them public. I know it’s not nice to boast, but I feel very honored to have a blog post about my work that starts with the mention of Michael Ondaatje (The English Patient), Alice Walker (The Color Purple), Russell Banks (The Sweet Hereafter) and Margaret Atwood (The Handmaid’s Tale ). And then while you’re there, don’t just look at today’s post. Spend some time looking around. It will be time well spent. The pigeons in the picture are not at the Frick. 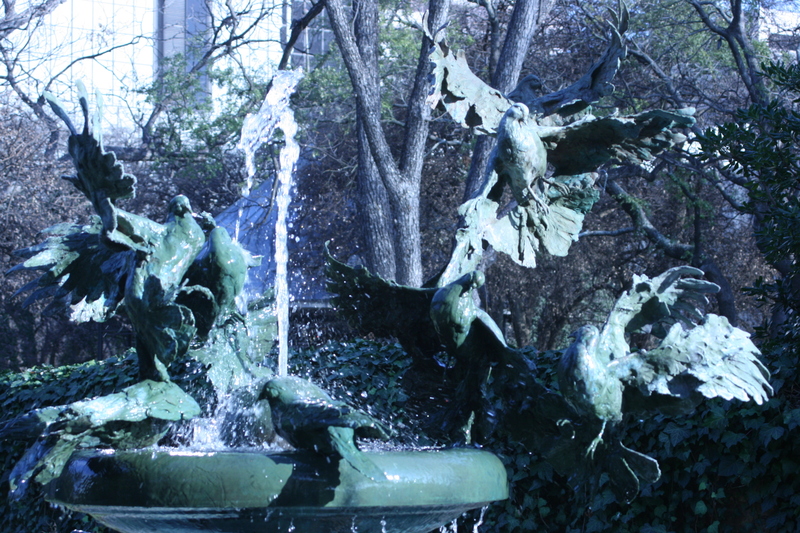 They’re part of a fountain at a former convent that now houses a school of art in San Antonio. The Frick is an art museum in New York. The poem below is a repost from a few years back. And we become the air through which they move. All of their warmth, all of their hue, and more. Dead bronze the things you see, the things you feel. Originally published in A Matter of Mind, Foothills Publishing, 2004. © copyright 2004, 2015, 2017 Joseph Saling and The New Word Mechanic Blog. Here’s how Five 2 One announced the inclusion of my poem The Road to Nirvanah (a Drama Review) on its blog. #thesideshow is a National Poetry Month project in which the journal is posting on its blog a daily “freaky midget poem or fiction piece.” My favorite so far is The Cow’s Fault by Monica Lee about the ideas that get into cows’ heads and their consequences. When you go to see The Road to Nirvanah, the subject of which is a Harvard Square production of Road to Nirvana, a play by Arthur Kopit, stay around awhile and read the other works in the #Sideshow. They’re short and they’re freaky. Who needs more reason to celebrate? That just makes me feel good. The sweat of honest work. The road that melts in light. © Joseph Saling and The New Word Mechanic, 1985, 2004, 2014. And while we’re on the subject of the farmer’s daughter, let’s listen to Crystal Bowersox. Her work is pure inspiration. Her words pure poetry. The following poem was originally published in Pivot in the summer of 2002 and later included in A Matter of Mind (Foothills Publishing, 2004). It was firstposted on this blog in March 2013. The reading is new for this post. Click to listen. Arrogance of youth that can’t stay still. At eleven PM Jason cut his hand. Here now to celebrate an empty tomb. 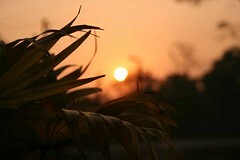 The spreading rose of day dissolves the night. Hallelujah toward the rising sun. I feel the cold rise up around my heart. Goes with me down the hill. He’s just begun. And I’m too old to remember where it starts. Inside the car on high. I’ll sleep at noon. © Joseph Saling and The New Word Mechanic, 2004, 2014.